Special feature im Basement: Crystal Math. and the role of art as a critical practice. In his artistic practice and research, Gerald Nestler focuses on global finance and economy. He coined the term "Econociety" to describe a realm in which roles and rules pertaining to the individual and society are produced from precariousness and risk. He is developing a reading of financial strategies, methods, and practices that form a world-producing apparatus in which "human derivatives" are exploited. At the same time he is interested in potentials for new forms of agency allowing for a recoding of processes of social participation from "transaction to action" after what could be called the "quantitative turn" (not only) in finance. Nestler graduated from the Academy of fine arts Vienna in 1992. From 1994 to 1997 he engaged in "field-work" as a broker and trader. In 2003, he received the Austrian State Scholarship for Fine Arts. In 2007, he published Yx . fluid taxonomies—enlitened elevation—voided dimensions—human derivatives—vibrations in hyperreal econociety, a reader/catalogue on finance and economy as fields of artistic research. In 2008 and 2009 he was awarded Austrian AIR-scholarships in Beijing/Nanjing, CN and Krumau, CZ, respectively. Recent artworks include The Trend Is Your Friend (with Sylvia Eckermann), Breathe My Air. A paradoxical conversation piece (3-channel-video, with Sylvia Eckermann) and Superglue. Artistic research on scientific research, Vienna Art Week 2011 (with Gerald Straub). In 2010, he co-edited issues 200 and 201 of German art magazine Kunstforum International on Art and Economy (with Dieter Buchhart). He is a practice-based PhD candidate at the Centre for Research Architecture, Goldsmiths, University of London and was awarded the Department of Visual Cultures Research Bursary in 2010. Contingent Claim. Portrait of a Philosophy. Brian Holmes, Armin Medosch and guests. The exhibition addresses a set of culturally rich and significant terms and practices that have exceedingly been appropriated by economic and financial interpretations. 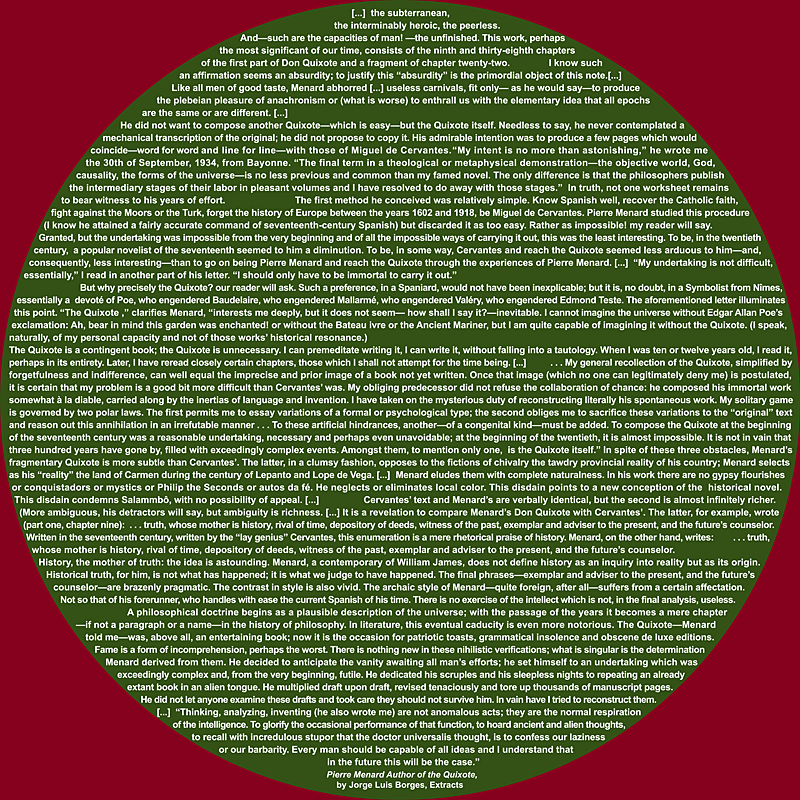 This neoliberal hegemony and what could be termed the "quantitative turn" in finance – unabated despite massive nationalisations in the financial services industry, to name but one example – are translated and recoded by what Nestler calls an artistic "derivative" strategy in order to activate an associative reframing of potentials and practices. Historic as well as current discourses in art, economy, politics and philosophy form an assemblage that can partly be used by the visitors. On Purpose. The New Derivative Order is a work in progress that alongside the artistic works includes performative events as well as talks and discussions. The events and the participants, the installations, videos, voices, drawings, texts, algorithms… are all "objects" of the exhibition – they populate the site (partially temporarily) and create contexts for further objects/events. The exhibition develops as a social sculpture, with its narrative strands appearing and manifesting during the process, in which particularly the events pose the question as to a reclaiming of agency, a common recalibration from transaction to action. 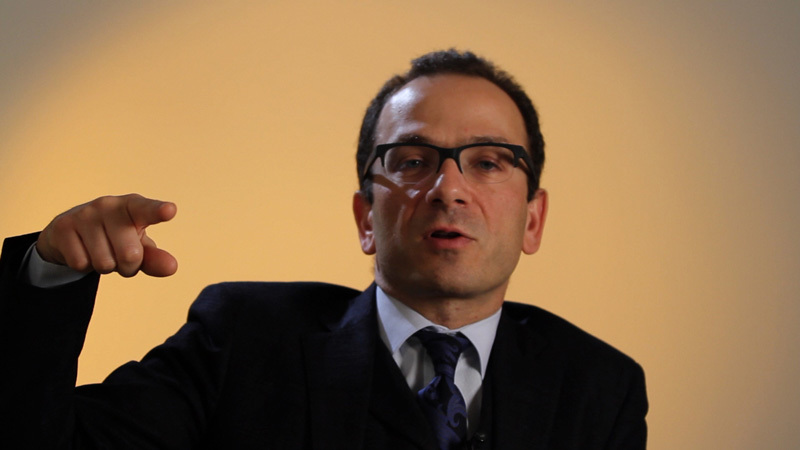 The video work shows Elie Ayache, the author of The Blank Swan. The End of Probability, 2011. Ayache, an options trader, financial engineer and philosopher, elaborates on his interpretation of derivative trading based on his reading of philosophical works by e.g. Quentin Meillassoux, Alain Badiou, Gilles Deleuze and Henri Bergson. In his critique of financial markets dominated by banks he replaces probability with the concept of contingency. Opposing the notion of value (which for Ayache is not a market category) he defines price as absolute (in the sense of Q. Meillassoux, "After Finitude", 2011). In his reading of J. L. Borges' text "Pierre Menard Author of the Quixote" he holds that prices are realised by writing as a contingent practice. The video is incorporated in the installation Bottomless Pit, Elastic. 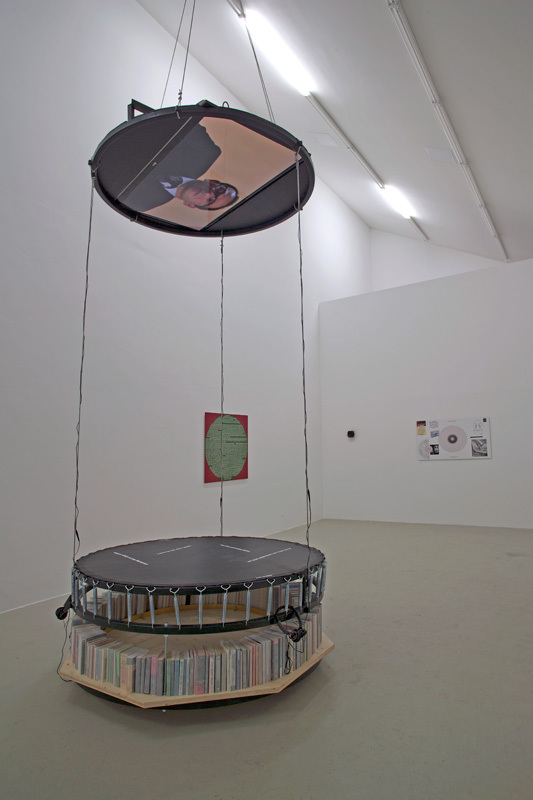 A trampoline or swing, the movements of the volatile architecture become tantamount to a random walk when visitors get involved. The work constitutes the skeleton of a "being" or "lifeform" – terms traders use when describing financial markets (see Knorr-Cetina quote above). Underlying it is an archival net of materials assembling on the one hand attempts to rationalise the situational technology of the future (due to the location of the exhibition, works by the Austrian School of Economics and theories buiding on them) and on the other hand critical and opposing work. The installation gives evidence to the inherent volatility of the financial framework: The market as the oracle of an instantaneous construction of future(s), which reduces to absurdity rationalisations with mathematical, social scientific and economic models. 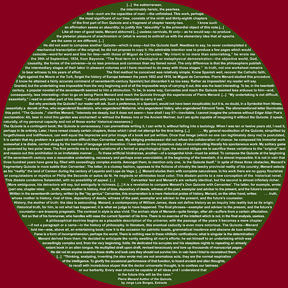 Thus, the work proposes a radical artistic and philosophical involvement in re-addressing the notions of margin, debt, credit, risk, speculation, and automation against what some term our 'future'. Work in progress. Text works as well as modified quotes from different sources, e.g. Jorge L. Borges (Pierre Menard the Author of the Quixote), Aristotle's definition of tragedy (from his Poetics) or Jack London (from The Heart of Darkness) are part of works or applied temporarily respectively. Based on the architectural design of the trading floor that precedes architectural modernity (patent by Ruben Jennings, 1878) the work maps its relations to contemporaneous developments in communication technology on the one hand and historic precursors such as the Greek theatre (initially a place of oracle) on the other hand. The work produces a panorama that traces divinatory practices from the construction of the oracle after consultation in ancient Greece to the construction of the oracle during consultation as dissolution of the present into an ideology of future(s) – the characteristic method of today's scopic and global theatre of finance. Financial algorithms (the name goes back to the 9th century Arabic scholar Al-Chwarizmi) are not only applied to transact complex processes but increasingly also to outsource decision-making. Currently operating at a speed of approx. 30 milliseconds they transcend the human threshold of perceptibility. The Flash Crash on May 6, 2010 (named after a term used for high-frequency trading) was called a "watershed event" by LSE-sociologist of finance Daniel Beunza since the date marked the first instance that algorithms triggered a collapse of prices. An audio recording of the incident from the S&P trading floor in Chicago elucidates this event at which human actors were 'expelled' for a period of time from market activity by automated trading schemes. Latest investigations into the matter oppose the SEC report and instead proclaim that wilfully initiated predatory trading algorithms have triggered the collapse (http://www.zerohedge.com/news/skynet-wars-how-nasdaq-algo-destroyed-bats). 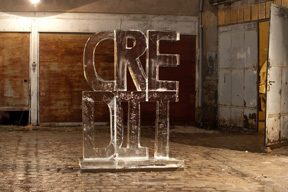 Ice sculpture in the courtyard of the art space depicting the word credit. Installed for the opening of the exhibition, the work melts contingent on the weather conditions. Love in the 21st Century (Cool Pop) re-actualises Robert Indiana's famous sculpture love (1964) by raising the question of the current state of recognition. 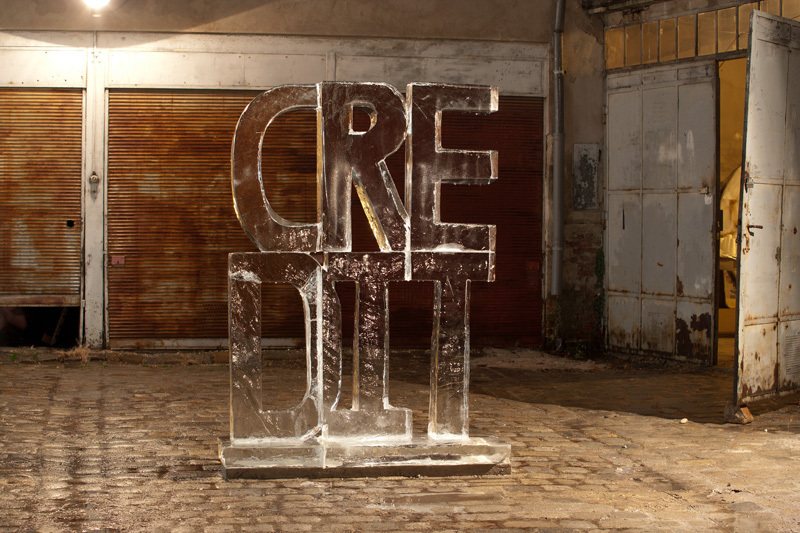 The term credit is applied to reflect upon our perceptions of social appreciation and thus acts as an indicator of its relevance today. 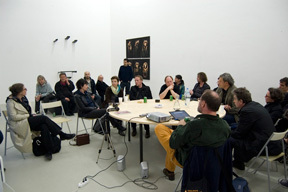 With Agnieszka Dmochowska, Karin Pauer, Gabri M. Einsiedl, Julia Mach, Filip Szatarski, Jasmin Hoffer, Martin Tomann. The performers stage a living sculpture or tableau vivant derived from Dali/Halsman's work In Voluptas Mors (1951). The common task is to act out a virtually (physically) impossible approximation to the photomontage and to hold the position as long as possible. Form and endurance effect a visual event that – far from being surreal – depicts the absurdity of current models of 'coherence' in the construction of community. A series of photographs of the performance is shown in the exhibition. 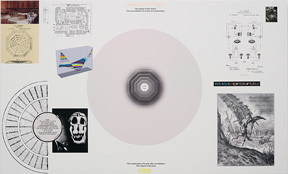 A large piece of paper serves as a recording medium of the discussions and talks and becomes a medium of agency over the course of the exhibition. The Black-Scholes formula – the arguably most significant mathematical formulation of derivative option trading (awarded with the Nobel Prize in economics in 1997) – is inscribed as a "water mark". The 1987 market crash is considered the event when the mathematical model collapsed in the face of trading as an emergent activity. Nevertheless, the formula continues to be used widely but option prices are calibrated in order to protect against incommensurability. Speech Act Algorizm incorporates the notion of recalibration and critically addresses social and cultural moments of derivativisation to activate a turn from transaction to action. Installed in the basement of the kunstraum BERNSTEINER, Crystal Math addresses the notion of the net as persuasive trap rather than communication tool – a pervasive scheme ranging from finance to data retention to web 2.0. (e.g., the branding of Facebook as a social network stands in stark contrast to its actual value as dark pool – unregulated exchange place – of information). In the words of Anthropologist David Graeber, "…that process that dislodges people from the webs of mutual commitment, shared history, and collective responsibility that make them what they are, so as […] to make them exchangeable—[…], to make them subject to the logic of debt"*. In finance, mathematical models (algorithms) not only make up 80 per cent of transactions in Western financial markets today; decision-making is sourced out to these processes as well. What we could therefore call a quantitative turn in finance manifests itself as a growing dependence, if not addiction, to mathematics. 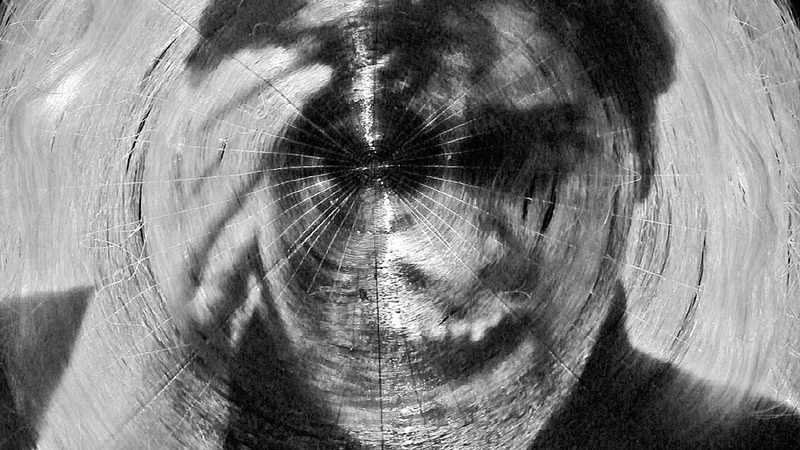 The notion of truth expressed in mathematical formulations has become a 'divinatory science' unfolding in a bottomless pit of split seconds so 'profound' that it not only opens deep gulfs between actors but also produces risks and hazards opening up yawning chasms in the social fabrics of societies and their institutions.